The 36-inch gas powered trowel is the most popular size. Reliability and performance are trademarks of this industry-proven trowel. 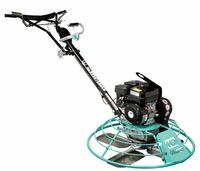 It operates with a 60-130 rotor rpm making it ideal for smooth finishes. Available with a standard pitch handle for blade adjustment.